This $500 award to an exhibitor in the Sonoma County Art Museum’s annual Artistry in Wood exhibit of the Sonoma County Woodworkers Association is one of the Foundation’s ways to focus on the Krenov legacy of craftsmanship in woodworking. Judges pay serious attention to detail and sensitivity to material — wood as the driving force within the selected piece, as well as a respectful interpretation of archetypes from the past. The Sonoma County Woodworkers Krenov Foundation award also serves to educate others about the Foundation’s mission and values about the craft of fine woodworking. Robin Wilson is the winner of the 2017 Krenov Award at the Sonoma County Woodworkers ' Artistry in Wood show for his Cafe chairs. The judges were very impressed with the subtle but impeccable craftsmanship and attention to detail. The chairs have understated frames and flamboyant claro walnut on the back supports. Robin made the chairs while a first year student at The Krenov School. This year's judges were Paul Reiber and Laura Mays on behalf of The Krenov Foundation, and Greg Zall, the 2105 winner of the award. 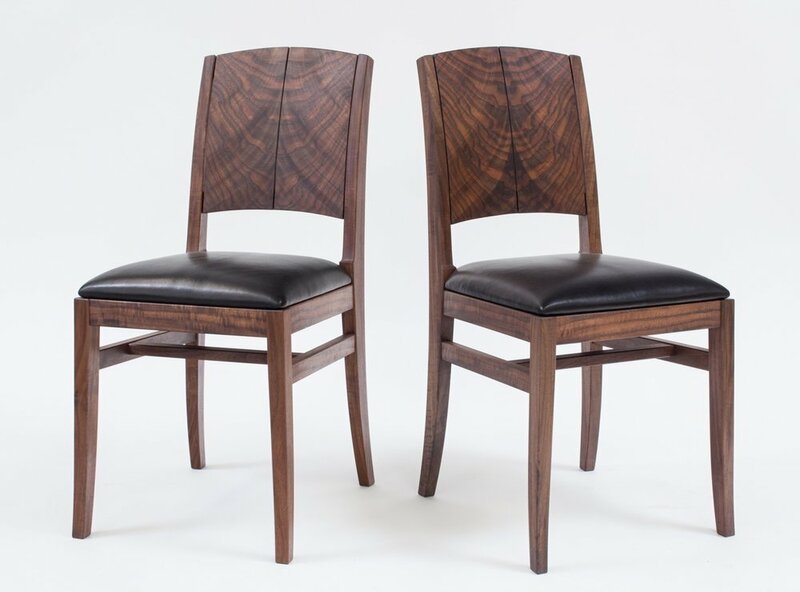 Robin Wilson's pair of chairs in Claro walnut, with spectacular bookmatched back supports. Ron Hock, Krenov Foundation President, presents the $500 Award to Robin Wilson. The SCWA Artistry in Wood show continues at the Sonoma County Museum in Santa Rosa until January 7th, 2018. Below is a video from the 2015 Award, explaining the criteria and why Greg Zall's piece was chosen that year.